Practice for the critical thinking skills needed for advancement and success in careers and life. ABE can be used to prepare adult students for taking the General Education Diploma (GED) test. The MathMedia ABE is a Complete Math Program: Math Software for Literacy, Numeracy, Family Literacy, Correctional Education and Workplace Basic Skills / Vocational training. Adult Education Software: This ABE and TABE program contains practice sections for Fractions, Decimals, Percents, Basic Algebra, and a separate word problem section to practice Algebra reasoning and basic Geometry principles. Students receive instruction and comprehensive solutions to teach each step in the reasoning process. Students may either begin with the included practice TABE tests to determine weaknesses or start with the learning sections and then take the included practice TABE tests. Adults entering or re-entering the workplace often need to take adult basic math skills tests for their future employer. Prepare for the adult basic education test or the TABE in an organized learning system with this math software tutorial package for adults returning to their education. To master 21st Century skills, students must have the mathematical foundation to take advantage of workforce opportunities. Students need a solid math education background to be part of the industrial technology society. To that end, start now with this easy-to-use and menu-driven math software program... you will glide from section to section as needed. 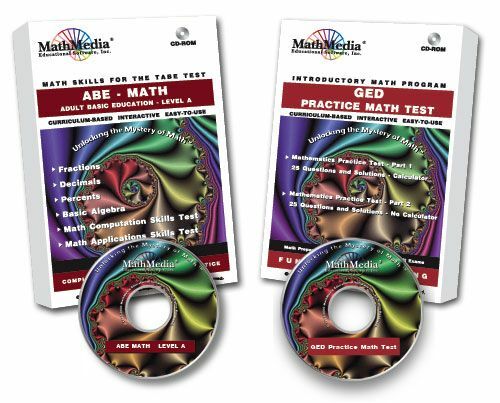 GED 2002 Prepare for and master the GED 2002 math test on CD or via download. This GED 2002 math practice test software contains two GED practice tests for math. Take both GED Practice Tests for Math Part 1 and GED Practice Test for Math Part 2. This GED 2002 practice test software will test you on all the topics which appear on the GED 2002 Math Test. All problems are interactive with hints and complete solutions. Both tests are scored and weaknesses are evaluated. If you score well, you're ready to go take the "real" GED 2002 test. If not, consider purchasing our "Basic Math Series" software to learn, re-learn, and review the topics which are tested in the math section of the GED 2002. This GED practice test for math will give you the confidence you need. This software contains two GED 2002 practice tests for the math sections. These two GED 2002 practice tests contain the exact types of questions asked on the "real" GED 2002 test. Prepare for GED 2002 math tests by practicing the same math problems that are on the GED 2002 test. Study and practice these GED math study programs and walk in prepared - knowing how to do the math from having practiced these Math concepts which are explained in detail.